If you are being investigated or charged with Forgery you should immediately consult an experienced criminal law attorney. Forgery is the act of knowingly adapting or faking an object or document. In terms of criminal defense, forgery usually refers to faking a signature, or some other aspect of falsifying a document in order to deceive someone for the purposes of a financial gain. Forgery is considered a form of fraud and white collar crime. Forgery can be classified as either a misdemeanor or a felony, depending upon the circumstances. 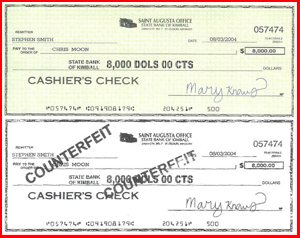 If you have been accused of check forgery, the amount(s) of the forged check(s) will determine if it is a felony or misdemeanor charge. Even if it is only a misdemeanor, a conviction can lead to full a year in county jail, whereas a felony forgery can result in 16 months to 3-years in state prison. If that is not bad enough, a forgery conviction will include a significant fine that can be as much as $10,000, including making court-ordered restitution to the victims of the crime. If you want to avoid these harsh punishments, you will need an experienced criminal defense attorney on your side who will fight relentlessly for your defense. An expert criminal defense attorney can raise a number of effective defenses. If you are convicted of forgery in California, the primary focus is given to the financial value involved in the forgery charge. The prosecutor must prove certain facts to convict you under the California forgery laws. There must be sufficient evidence to prove that the act was committed with an intention to defraud, whether the act was successful or not. The elements to be proved depend upon the nature and severity of the case. A good and well-orchestrated defense can often have your charges dismissed or significantly reduced without the stress and high cost of a court trial and without having to serve time in county jail or state prison. A misdemeanor forgery charge is punishable by an imprisonment of up to one year in county jail. A felony forgery charge is punishable by imprisonment for 16 months, or 2 to 3-years in state prison. A felony forgery charge along with one or two previous “strikes” will add additional prison time under the “Three strike’s law”. Misdemeanor charges can result in fines of up to $1,000. Felony charges can result in fines of up to $10,000. You may have to pay restitution to victims(s)and may have to take part in community service or labor. You may have to to perform community service.